SoundMagic WP10 review | What Hi-Fi? These days you wouldn’t think of setting off on a road trip without a sat nav, but while less convenient, a trusty map and AA Route Finder print out would ultimately get you to the same place. The same is true of wireless headphones. While Bluetooth has dominated much of the last decade thanks to its ubiquity and convenience, there are those that do the same job via old-fashioned infrared or radio frequency. 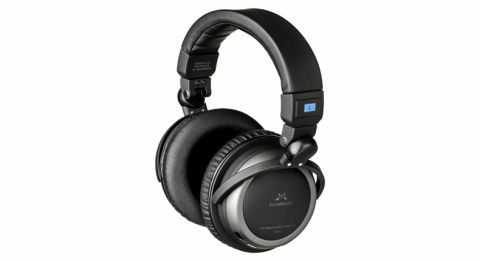 The SoundMagic WP10 headphones are an example of the latter, which means that instead of receiving music directly from a source like Bluetooth headphones do, the WP10s stream from a small transmitter wired to your device. You can connect three ways: by wiring the transmitter (which is about the size of three packs of gum) to your portable device via 3.5mm cable – or even to the headphones themselves for passive listening – or using the included RCA cable to hook it up to your hi-fi kit. Alternatively, you can connect the transmitter to your laptop or PC via USB cable, going through its built-in DAC. The first two methods are simple: press the power buttons on the transmitter and left earcup, and then the ID button next to it on the earcup to pair. However, the transmitter method requires both headphones and transmitter to be charged. The bottom line is that, out and about, you’ll need the transmitter wired to your device. But on the plus side, the WP10 is compatible with almost any music source. And with a wireless range of 50m, they are arguably much better if you like to wander around away from your source than Bluetooth headphones, which have a typical range closer to 10m. At first glance, the chunky WP10s don’t look ideal for taking with you anyway. With jumbo earcups, richly padded pleather pads and belt-thick, leatherette-wrapped headband, they certainly don’t look very portable. However, their ability to fold into a ball, thanks to collapsible earcups, helps their case. SoundMagic has played it safe in the design department, and while we don’t doubt the WP10’s ruggedness will stand up to the hustle and bustle of the daily grind, at this price we would prefer less plastic and more metal on show. You won’t hear any grumbles from us where comfort is concerned though; the earpads create a firm, comfortable and well-isolating seal around your ears. We get stuck into our LG G4’s music library and Neutral Milk Hotel’s The King of Carrot Flowers Pt. One fills the SoundMagic’s open, expansive soundstage with tangible guitar strums and textured, double-layered vocals. Accordion melodies come through thick and fast, all too willing to showcase the WP10’s agile, articulate demeanour. Vocals generally sound clear, smooth and fairly expressive, with mids falling headfirst into the WP10’s comfort zone. However, the low-end is a little on the murky side, and their bright treble almost wilfully sticks out in the mix, making for a lively rendition of Suede’s We Are The Pigs that isn’t sparse on wince-worthy riffs and cymbal crashes. Tonal balance needs smoothing out, and the presentation could do with a larger dynamic window to operate in too. A lack of dynamic expression and punch sees them downplaying the sweeps of guitar solos, and sucking the excitement out of the track’s explosive opening launch. Neither is remedied through using a USB connection, although you do get a touch more clarity, solidity, precision and volume than offered by the 3.5mm port. The SoundMagic WP10 headphones will no doubt have their fans – more likely home users who want to play music from a variety of analogue and digital devices and will appreciate the greater transmission range. But for portable use, they have their caveats. And ultimately, they need to sound better too.